Ethosa Park were all the animals are. We got up at the ungodly hour of 5:30 a.m. for our 6:30 a.m. game drive into the western end of the Ethosa Park. The temperature was cold cold. We had to dress with 5 layers of clothing to fight of the chill. Add to that a blanket since we were in an open vehicle. Of we went to Ethosa. This was once a lake but has dried up and now is a salt pan. You would think nothing lived there but the opposite is true. You find all the animals of southern Africa. 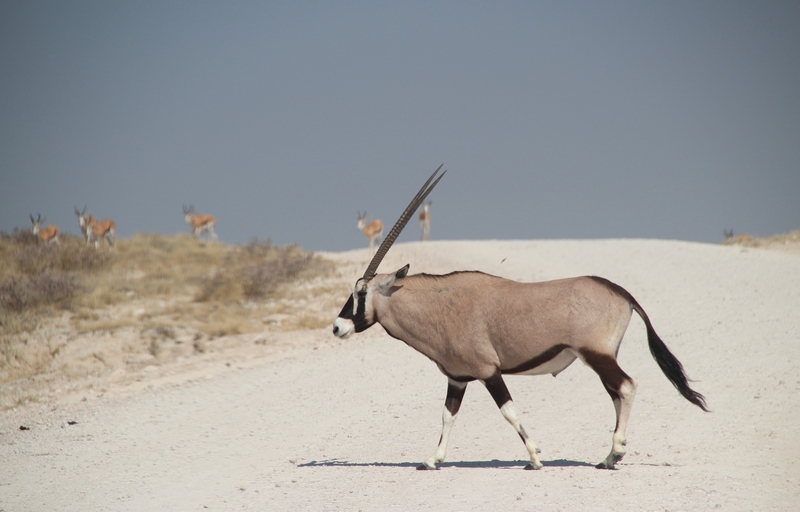 Elephants, rhinos, giraffes, all kinds of birds, lions and many different types of antelopes. The drive lasted 6 hours. Our guide had a wide knowlege of the animals and could tell from a pile of dung which animal had deposited it, how long ago, which direction it was heading and more. His eyesight for seeing game was truly remarkable. We came across a lion kill. Two females and four fully grown cubs. They were dining on a zebra who lost the race. As they ate you could hear the cracking of bones and the snarles at each other for the food. The two adults waited their turn until the children had been fed. We stopped for coffee and biscuits in a wired enclosure so we weren't eaten by the lions. Later in the morning we had pealed down to shirt sleeves. We returned to Andersson's Camp and sat beside the waterhole we viewed animals coming within 50 feet of where we were having supper. Andersson's Camp is in a private park next to Ethosa Park called Ungava. Our camp is surrounded by an electrial fence and we are caged while the animals roam free. Everything is reversed here.